Piping and instrumentation diagram, also called P&ID, illustrates the piping processes and interactions with other installed equipment and instrumentation. P&IDs are often used in the process industry to show the process flow and other installed equipment and instrument. What is the Difference Between PFD and P&ID? Instrumentation detail varies with the degree of design complexity. 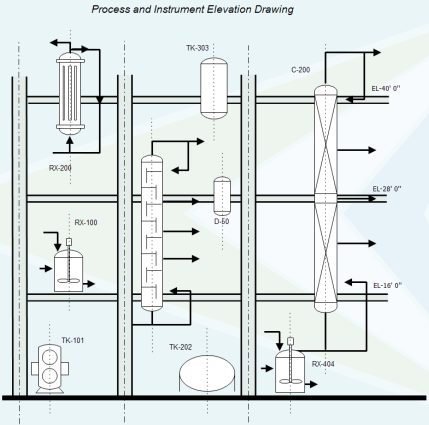 For example, simplified or conceptual designs, often called process flow diagrams (PFDs), provide less detail than fully developed piping and instrumentation diagrams (P&IDs). Since a PFD shows less details than a P&ID, it is used only to understand how the process works. To better understand the process and instrumentation diagram, you need to decipher the symbols used in the piping and instrumentation diagram. Letter and number combinations appear inside each graphical element and letter combinations are defined by the ISA standard. Numbers are user assigned and schemes vary. while some companies use sequential numbering, others tie the instrument number to the process line number, and still others adopt unique and sometimes unusual numbering systems. The first letter defines the measured or initiating variables such as Analysis (A), Flow (F), Temperature (T), etc. with succeeding letters defining readout, passive, or output functions such as Indicator (I), Recorder (R), Transmitter (T), etc. 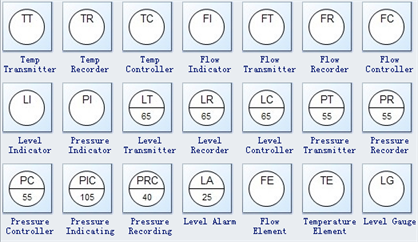 Below are some piping and instrumentation diagram symbols with letters. What Should a P&ID Include and NOT Include? P&ID is a very common term used in the world of process industries. A process engineer in a manufacturing plant need to create new and/or modify the already existing P&ID to the as-is plant modifications. All the Chemical Engineering and related Engineering students have also learned about it or at least heard. A P&ID is a detailed graphical representation of a process including the hardware and software (e.g., piping, equipment, instrumentation) necessary to design, construct and operate the facility. As defined in the PIC001: Piping and Instrumentation Diagram Documentation Criteria by Process Industry Practice (PIP) - a consortium of process industry owners and engineering construction contractors who serve the industry. Learn how to create a piping and instrumentation diagram here.